I like to start with my antagonist, the villain. When I begin writing, I usually always introduce the protagonist first, the main character, because that's usually the side I will follow most. However, the antagonist, as mentioned in the first step, is the reason the story even happens. If it weren't for them, the lead characters could likely have gone on to live long, uneventful lives and been some kind of happy. The antagonist is the key to the plot. 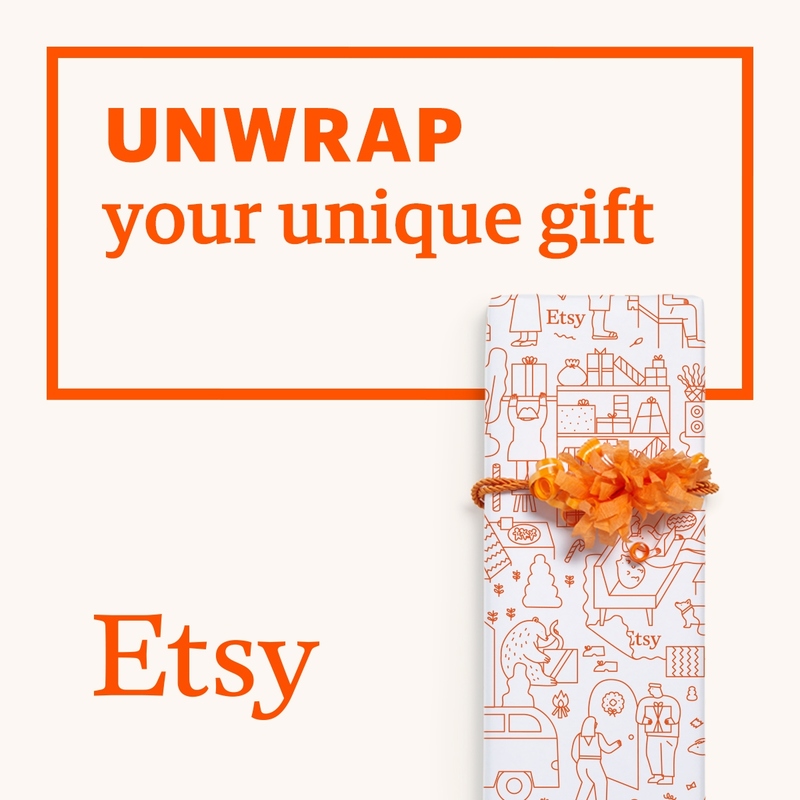 Now, first, stop trying to create, right now. Stop thinking on it. I know that when I get a new idea for a plot or something, the villain's appearance is usually created alongside it. For example, even as I was writing the first part of Kysharok and created a vague understanding of what Varai was running from, the villain was already standing there, grinning darkly in his direction. When I started talking about the first step I take being the antagonist's plot and motives, my villain was even clearer, but that's because I had a head start since I started writing anyway. But when I come up with ideas, the characters are already there. Think back to when you were forming your villain's intentions - was there someone there? A face or figure? I don't usually see an entire face, myself, if I see any features at all. It's the hair, clothing and general attitude I see. Now, I usually find it quite difficult to divert from my very first vision of a character; once I have some kind of image, it sticks, even if I don't want it to. In these cases, I find it best to just roll with it, because if you have an image in mind, then you're character is already right there. The only times I would change the character's appearance is if they're identical to Aragorn or something, in which case I try to change bits and pieces. This is tricky, though, because if I try to change too much too fast, I won't bond with the character and I'll end up reverting back to the original at some point or another - and I am aware this all sounds extremely pretentious but please bear with me. Changes can be very simple. Sometimes just moving (or adding) the placement of a scar, and changing hair colour and whether it's short or long, loose or bound can make a massive difference. Maybe also the eye colour or placement or even a tattoo or marking. Now, I'll say here, that there is nothing wrong with taking inspiration from other sources. In my trilogy, I've gained inspiration from other books, games and films, but the trick is to adapt on them and not leave them as they were when you got them. Make them your own. If someone has an awesome and maybe unique appearance in your favourite movie, then by all means use it as a base - but you must be able to relate to the face, and you must show some creativity in it. I'll give you a simple example: Varai was based loosely on Renji Abarai from Bleach. I especially loved his tattoos - however, I also love the tattoos of the Dalish in Dragon Age 2. I couldn't leave Varai's hair red (and no, before you ask, the name is one I've had for a few years and never used, while I'd only first laid eyes on Bleach mid May this year. It's an unfortunate coincidence) so I turned it brown, and altogether, including the rather awful drawing I've done of him so far, he does look his own. Now, going back to appearances: you may hear writers say from time to time that some things "write themselves" - this is very true. Not for every writer, of course not, but for me and my dear friend Lucy it is. When things write themselves, they flow smoother, characters can become more exciting and 3-dimensional, and plots take off, opinions are formed. If you had an image in mind when putting together their motives, then that character has already began to write itself. This does not mean you have no control - you're still the one with the pen in your hand, afterall - but it does mean that your character may well also already have a personality. Only once have I ever tried to decide what my characters would be like ahead of time, and every character I tried it with failed. I tried too hard to stick with my character's plan and specifications and I didn't believe in them; they each tried to go in their own direction. Now, you won't notice this until you start actually writing: I did imagine Varai's personality differently to begin with, but I've learnt not to try to grasp onto the first impression too hard. Once I start writing, they seem to already have personalities - their responses come naturally, their opinions are different, their passions are different, and they are generally unique and already partially built up. Whenever I try to change a character's personality - and I do from time to time if I'm disappointed with their introduction - I have to try really hard, and sometimes it can drain my creative energy and I find it difficult to keep putting the work in. That's why I'll only do it if I absolutely must, and will otherwise either live with it, or alter my plans to accommodate the nuisance of a character they'll be - but I'll love them anyway. Nowadays, I don't write a plan for my characters - antagonist or protagonist - instead, I just write them, and make notes on their appearance and habits as I go - so I do it backwards. This makes my characters more believable to me, and I'm able to put more effort into them. I won't tell you to do this. Some of you won't have an image in your mind. In these cases, I can't offer you much advice. Maybe picking up a pencil and having a draw will help, or maybe planning out your characters will work for you - everyone is different. I'm hoping to get some guest input in on these sorts of subjects, but I can't guarantee it. I've mentioned him before, in the starting post. 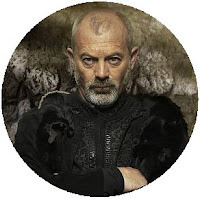 Again, I'm looking at Keith Allen's portrayal in the BBC's 3-season long series, Robin Hood. He was the most frightening villain I've ever come across in any film, tv series, book or game. He was just vile and genuinely stressed me out whenever he was on screen. But, unfortunately, I don't know what it was about him that made me so uncomfortable. He was a general tyrant. He only wanted money and only wanted power; he had almost no heart at all and would kill anyone because he fancied a show. Robin Hood only made matters worse for the people of Nottingham by sticking his nose in everywhere and upsetting him - sometimes just for a laugh. But, what made him a great villain was that, despite having little to no fragments of his heart left, he had habits. I read once that a good villain isn't just pure evil (though, if they're going to be pure evil they'd usually be an entity unto their own, some unique being made from darkness and hatred which would spare them the nuisance of shame, regret and any other emotion), he is human. Or elf. Or dwarf. Or, really, any race you choose, but they still have feelings, opinions, preferences and pass-times. And the Sheriff has a love for birds. He has a few pet birds, and, while I personally cannot stand to see such things, he crushed one of them by accident in a rage, and got quite upset about it, then in another incident, yelled at his second because he didn't want him to frighten the rest of them. The birds were the only time he showed any kind of love or compassion. So along with being tenacious, and an arse, he did have a softer side - it was just buried beneath golden Plate. Inkheart. I think I read the book. I don't remember it. But I've seen the film many times. It's an unusual fantasy film, based firmly in this world, unlike Harry Potter which is simply alongside it, in my eyes. But the villain in Inkheart - the first one of the series, and the only one I've read or seen - was a man named Capricorn. Now, the fantasy aspect of the story is that there are people called Silver Tongues, people who by simply reading aloud can bring characters to life to stand before them. Unfortunately, the characters, beings or items that were read out couldn't be chosen, and would be picked out at random, and unfortunately still, the main character didn't realise he had such a power until he'd managed to read out a few villains, including Capricorn, and sent his wife into the book (that's how it works, something comes out, something has to go in). The book Inkheart is a book within the film, it's the book Capricorn was read from and the book Mo's wife was sent into. Within the book, Capricorn was simply a henchman to the lead antagonist who I believe is introduced in a later book in the trilogy. Capricorn's goal was to destroy every copy of the book he could find in the real world, so that he couldn't be sent back in. After being read out, along with some of his own henchmen, he was of highest authority among them. If he were sent back in, he'd go back to being a lowly henchman, but if he stayed out, he was a king. 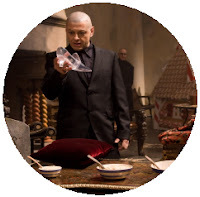 The reason this guy was a great villain was, not counting that he was played by Andy Serkis, that he was so dry and normal, and fascinated with the new world. Yes, he wanted power, yes, he wanted money, and yes, he killed whoever got in his way, but he was entertaining to watch and read, that much I remember. I quote: "...what was that sticky stuff called?" "Uh...duct...tape...my lord?" "Ahh, duct tape, I love duct tape!" - this is a great trait that I love of him. He's believable. 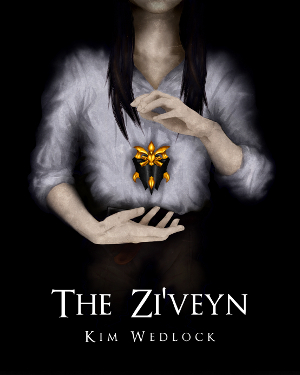 He's been read from one magical world to a significantly different and less magical one, and hasn't forgotten that fact, even though, at the time of the story, he'd been there for about thirteen years. I don't recall many habits, but he was also close to his mother, and was generally an interesting character. I've seen a lot of fantsy films and read a lot of fantasy books, so I've been shown many different villains - the four in this list were the only four that jumped out at me as being relevant and truly interesting. I am a Harry Potter fan - but never have I read one of the books. I love books and films, but after having watched each film, I'm not sure I could sit down and read the books. I already know what would happen, and while bits and pieces are left out of the films, of course, the general story is still there. But the reason Voldemort makes it onto this list is because of what he's like. He never wears shoes, and the way he holds his wand is oddly gentle. This fascinates me as it is. 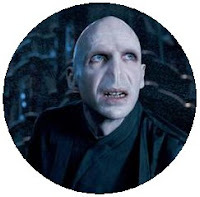 Everyone else hold their wands quite firmly, and their "swish and flick"ing is a bit clumsy - but Voldemort has so much more elegance about him, despite clearly being a bit gone in the head. There's also his unwavering determination. Was there ever a hint of doubt there? Frustration, yes, but doubt? No. Despite being weak and almost destroyed when he cursed Harry, he was still trying to get back to his...well, business I suppose, even after twelve years. It took him a further three years, I think, for him to even regain his form, but never once did he waver. Those around him did, certainly, but not he himself. He also managed to influence many around him, mostly through fear, I believe, but to command such attention and standing among the kinds of witches and wizards he did was still impressive. His voice was also not very crisp, it was slightly strained and quiet. That might not seem important, and indeed it isn't, not to his power or anything, but it adds a little more to the character himself - either on the part of the writer, director or actor himself, it doesn't matter, it still adds another aspect to be thought about, and with it has brought along others. Maybe a villain could have a weak sense of taste or smell - nothing that would necessarily hinder them with their goals, but would give them more depth, even if it's only by a smidgen. I do love Pirates of the Caribbean. Barbossa is my favourite villain, but both he and Davy Jones have similar factors. They're both different, but they each have habits and obsessions. Barbossa, for example, he loves his apples. Davy Jones likes to play his organ. He also still carries his locket with him despite his outward feelings towards Calypso. Both of these villains are understandably pissed, they have good reasons to behave the way they do - and whether they are at fault for it themselves or not is irrelevant. 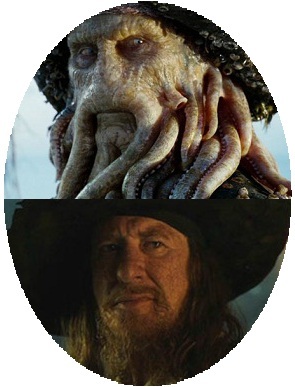 Barbossa wants to reverse his curse, while Jones is just trying to live the life he's been given. Barbossa also likes his hats, and has an on-going one-upping match between himself and Sparrow, while Jones has a habit of enunciating, in a manner, and making strange vocal sounds. Both of them are different from eachother, but they both have traits that make them deeper characters, and more enjoyable to watch. And the only reason they're "villains" is because they've crossed paths with Jack Sparrow, and because he's on Will and Lizzy's side, we're equally supposed to side with his views. I particularly like it when Barbossa joins them in the third film. Neither of these villains are evil, they're just going about things the wrong way, and are equally irritated by the main character. I have personal expectations from villains, now, but at the same time, I never seem to notice when those expectations are not met. I don't really notice how 2-D Tai Lung is - yes, he has a motive, but he doesn't have any habits or anything else to him but his thirst for power and strength. The lead military guy in Avatar - I deem him the closest thing to a villain in the film - equally doesn't have any habits, he's just obsessed with reaching his goals. Yes, I am just staring at my DVD collection right now. Deathwing has depth - he's insane, and has been for about 10,000 years, driven so by the Old Gods. He's also been deemed dead several times only to pop back up to say hi and kill more dragons. I wouldn't actually be surprised if his "death" in Cataclysm was just another, more elaborate fake one and he popped up at level 100, having teamed up with Sargeras, and finally blew up Azeroth. What I'm trying to get at in a really round-about way is that antagonists are people too - they think, love, fret and obsess like anyone else would, just maybe about the wrong things. They have favourite foods, things they look forward to and things they don't. They might love bath time with a rubber ducky, or they might really have something against dental hygiene. The purpose of my examples was not to encourage you to necessarily try to develop your characters too soon, it was to put some points out there for you to keep in mind when you're writing them. They may or may not write themselves, but habits like these don't come naturally to me. I have to keep them in mind if I have any chance at deepening my characters. Then there are other things to keep in mind. Assuming that your villain is not the afore-mentioned ball of dark hatred which is exempt from the weakness of emotion, you need to consider such weaknesses for your fleshy antagonists. Would they feel some kind of regret? Shame? What about physical weaknesses? Their heads could probably be cut off the same as anyone else's. Do they possess magic? Would it protect them with wards? Or is it just a simple human who [SPOILERS] could be taken down with a single bullet like Lucien Fairfax? He was just a man, afterall, but getting to him was the tough part.